It feels so good to be back in the field, fingers in the soil and feet in garden boots. We had such an awful weather in the past few weeks that it was impossible to work on the farm. Snow storms in the South is nothing fun. You get 2 minutes of fluffy snow and a week of ice. Not to mention the whole state shuts down because of an inch of snow on the ground. As some of you know, this is my fist year as a market farmer. I am trying not to freak out here. Those two weeks of so-called snow storms, not only destroyed my PVC Greenhouse (will show you the disaster next week), but also set me three weeks behind. I guess such is the life of a farmer… I used to not care about the forecast; now I look at it fourteen times a day. Anyway, as soon as the sun came out for more than a minute and I could walk in the field without sinking a foot down in the mud, I was out there. First thing, I finished my pea trellis (I started working on it before the bad weather). You see, here in the South (zone 7b), we can start sowing peas after Valentine’s day. We can still sow until the end of March, so even though I am a bit late I’m still well within the recommended sowing dates. My garden beds are 30” x 30′. I have six beds that will need two trellises each, for a total of 12 trellises. Two of those beds are for beans, peas and cucumbers that will need to be able to climb. The other four are for peppers and tomatoes, which I will have to tie. I was looking for a trellis system that I can install rather quickly. That will be affordable, can be taken down easily, and that is made of materials I can reuse for many years. Of course, it has to be strong enough to support the plants (you can’t believe how heavy they get…). I researched many kinds of trellises, even collected the visuals in my Pinterest Trellis board. But finally settled on this design. After building this trellis, I feel pretty good about it, it cost me some money but it was easy to install and seems pretty strong. And Hortonova net for climbing vegetables from Johnny’s Selected Seeds. I purchased this 6 1/2′ x 250′ feet roll for $43 (about $5 for 30′), but they also have a much shorter length on this page. Total cost per trellis is $59.31 before tax. Not that bad considering I can use all the materials except the net for many years. I drove the T-posts one foot into the ground every 5 feet down the bed, so I have 6′ above the ground, which is the minimum, I think, for climbing plants. If you can afford the 8′ T-posts and drive them 1.5 feet in the ground, I think it will be better. Probably much stronger. Then, I cut the net to the length of the bed and wove it down the posts. 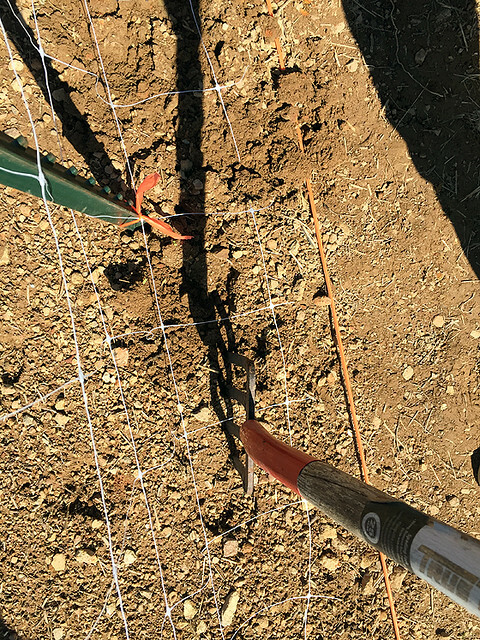 Next, I placed the PVC tees on the posts, and lastly, wove each of the rebars through the net and placed them inside the tees. 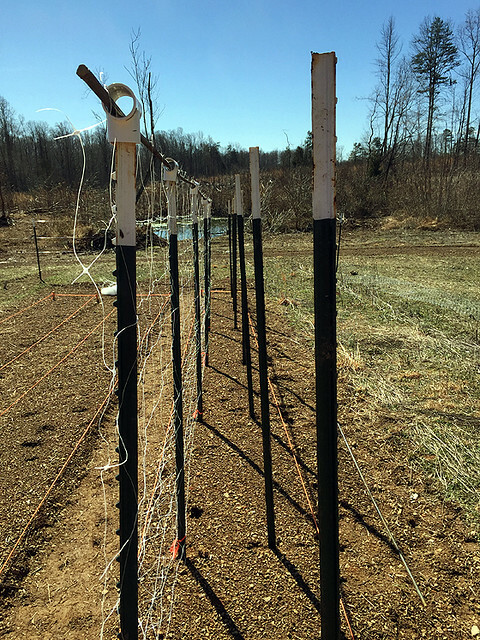 Once the peas start climbing, they will pull the net down, but for now I secured it to the bottom of each post by tying it. This soil is plowed and tilled, but since we had so much rain and snow/ice, it formed a crust that I wanted to break. 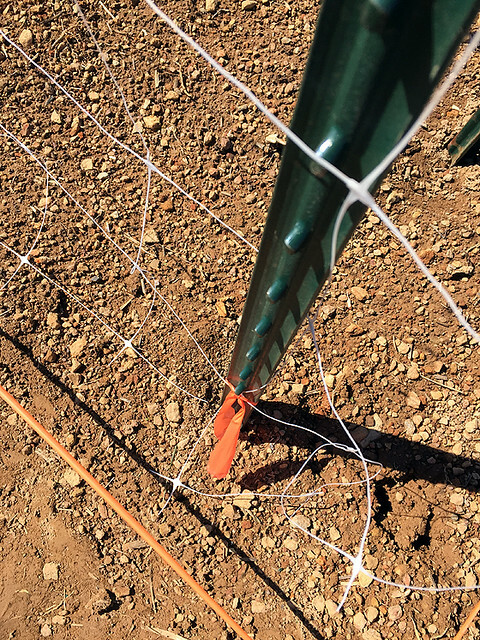 I should have done this after I placed the posts and before I installed the net, but I didn’t. Anyway, it wasn’t too hard even with the net in the way. Next, I applied Espoma organic soil supplements. This is the time to add some compost as well. Planting is easy peasy. Literally. 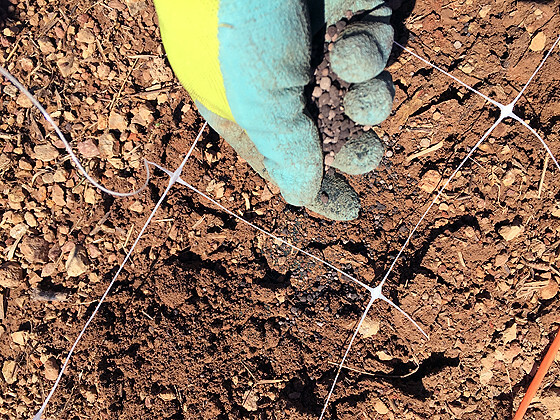 Each square of the net is 5” wide (even though they say it’s 6”…). 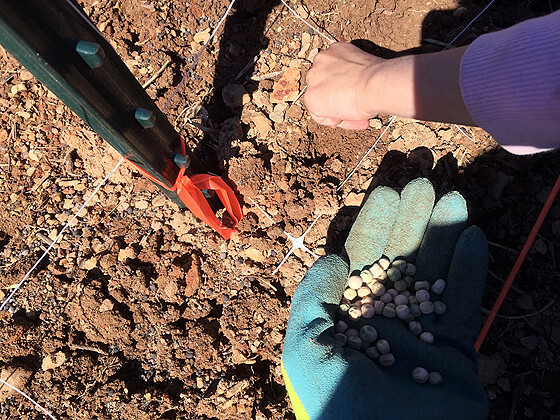 Peas need to be planted 4”-6” apart, so my little 2.5 years old farm hand planted one pea in the center of each square (5” apart). We planted 64 peas down one side of the bed. The other side is going to be the same kind of trellis for beans. I will also use this trellis for cucumbers and climbing squash. Next year I can either leave the trellis in place and plant something else in the same spot or take it down and move it to a different bed. 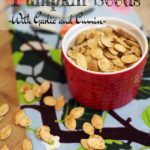 Make sure to check out my post about the right way to clean after peas and beans. You don’t want to pull those plants out of the ground like we do with most of the other crops in the garden. Read why here. I hope my peas will be happy with this trellis. I will post a picture here once they started climbing. Tell me about your pea trellis. Do you have a successful trellis design you’ve been using? Great setup! I love the idea of using the T PVC couplers! 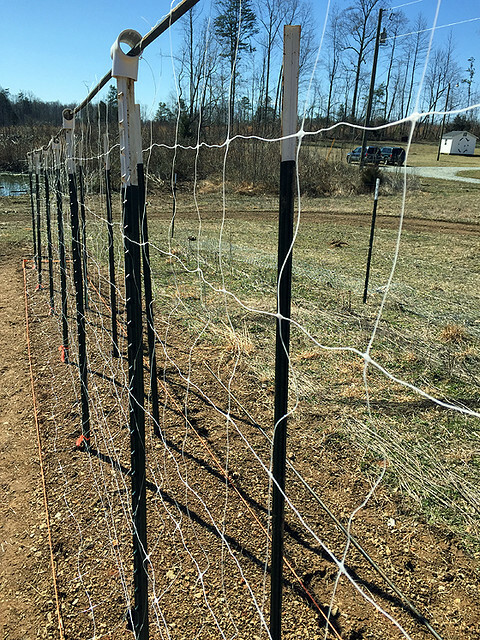 We’ve used fencing wire in the past and it is so cumbersome. This is awesome! I’m not farmer, but as a gardener, I do the same thing too. I’m always looking at the weather forecast. My husband just asks me if he wants to know what it will be like and is shocked on the rare occasion I don’t know. Here we plant peas on St. Patricks day or after (though I know from experience that I’ll be fine planting until mid April), but not this year. We still have a couple feet of snow on the garden. Who knows when it will melt. The peas that I’ve grown in the past (Cascadia snap) only get 3′ tall so I use much shorter posts than you. And I just string compostable twine horizontally. Occasionally I’ll have to use more twine to keep them climbing right. 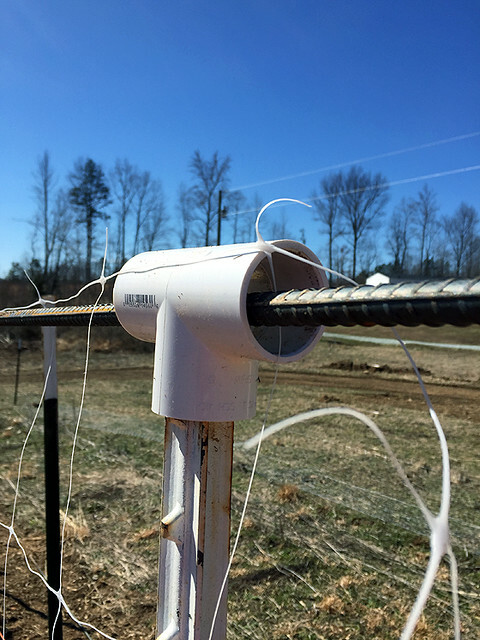 It is harder to set up with individual twine, but a lot easier to take down. This is the first year I am using this kind of net. I will have to see how hard it will be to untangle the vines from it since they go to the compost at the end of the season and the net don’t. I used a twine before that I could throw in the compost pile. It made a very easy clean up. I’m looking forward to seeing your trellis filled with green goodies! How do you plan to incorporate these into your crop rotation? 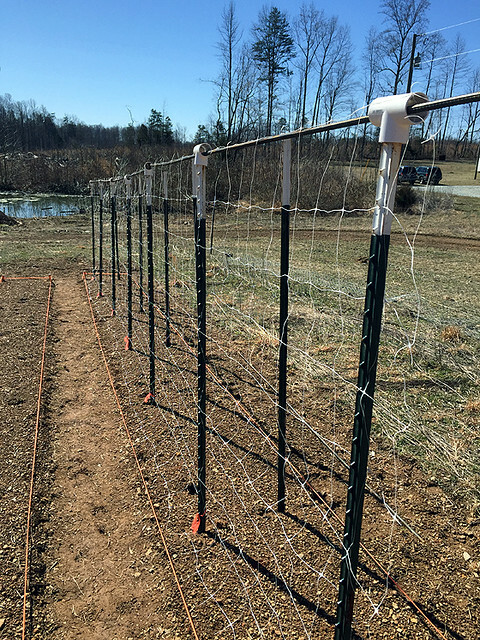 I’m starting fresh on my new land and gardens this year, and trying to decide for a more permanent type trellis system or something I can move when I rotate crops. Will be checking out your pinterest boards for ideas! I will probably be able to keep the trellis in the same spot for two years. After the peas, next year I can plant tomatoes, peppers, eggplants, or cucumbers in the same spot, but then, the year after I will have to plant roots or leafy crops in there so I will probably remove it and set it up in another bed. I spied your trellis support in another post and it inspired me to build the permanent trellis system for my 3 very young table grapes. I attached cedar posts to three of my raised garden beds and on each post I measured-up and drilled holes for the rebar cross beam cane supports at 3 different levels, looks like a rebar fence panel and “strong as Bull”! Next year the garden furniture is going to get a Hammerite spray of “rust” color. I figure if every eventually rusts I may as well be comfortable with it! That’s a great idea. The idea of a rebar on the top really works. When I started gardening I didn’t realize how heavy climbing crops can get. It holds them well. One of the trellises is located in a bed between a cherry and apple tree. I figured the grapes can eventually jump to the trees and trellis up those and when harvesting the rebar trells will support my ladder. I did a little research and found that the grapes and fruit trees companion well together. We are in january now and to plants the peas it is early or not? please I would like to know. Because last year I did not get much? As I planted in april. Almas, do you know what gardening zone are you in? You can find out here by entering your zip code on the top left. Let me know and I’ll tell you when to plant. I spotted a pretty slick bean/cucumber/tomato trellis on the way into work this past year…. T-posts with a cattle panel attached. 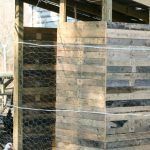 Cattle panels, or feedlot panels, have squares, like hog fence or the nylon you show in your version, but made with very sturdy, heavy galvanized wire. They aren’t very expensive, and will last forever. A 52″ x 16′ Feedlot panel is $40 at Tractor Supply. I think I’m going to try that this year. 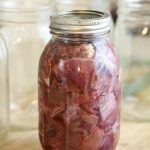 It should be pretty easy to clean off at the end of the season and store easily, and once you have it, you probably won’t ever need another. Yes, I saw those too. I didn’t try them but I know they will work great. I decided on the net because I have 6 more beds that each has two trellises like this one and the net cost me $43 for 250 ft. It was more economical for me but if you have a smaller garden or if you can invest more money the panels will work great. You can also do cool things with them like bending them in an arch and making a tunnel that the plants can climb on. Especially fun to build something like that for kids.